This candy is effortless! 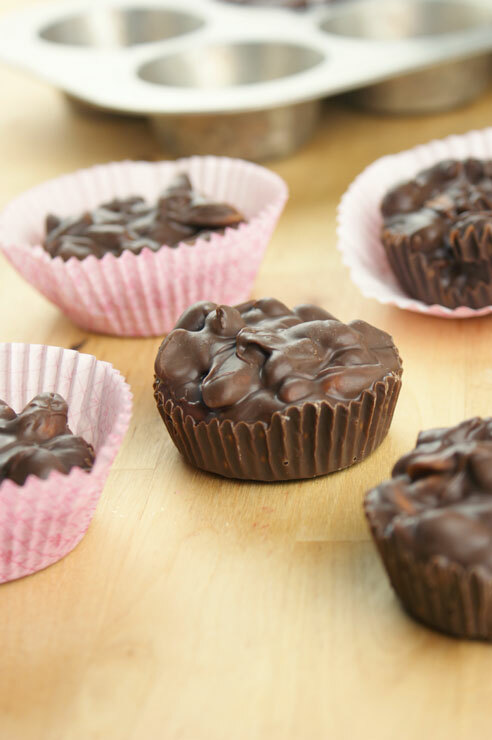 Let the slow cooker do the work and enjoy the delicious end result - chocolate candies! 1. Layer ingredients by first pouring the peanuts in the bottom of slow cooker. 2. Layer the chocolate chips over the peanuts. 3. Top with the Vanilla CANDIQUIK® chunks. 4. Place the slow cooker temperature on low and cook for 1.5 hours. Do not stir. 5. After 1.5 hours, stir the mixture with a large spoon or spatula. 6. Drop the candy into a lined cupcake pan, mini cupcake pan, or by the spoonful onto wax or parchment paper. 7. Allow the candy to set completely before serving. Speed up setting by placing in the refrigerator. Because slow cooker heats can vary, check mixture after 1 hour to make sure the candy coating is not burning. You will notice any scorching/burning by the candy coating turning a light brown color. To prevent scorching, try to prevent candy coating from resting on the sides of the slow cooker. You may start to notice a smell after about 45 minutes as the peanuts become more fragrant.